LaMarcus Aldridge had 25 points and 10 rebounds, and the San Antonio Spurs held on for a 107-99 victory over the Minnesota Timberwolves on Wednesday night while opening the season without leading scorer Kawhi Leonard. The Spurs were without Leonard and Tony Parker, but they had enough to hold off the revamped Timberwolves. Minnesota bolstered its young lineup with the addition of veterans Jimmy Butler, Jamal Crawford, Taj Gibson and Jeff Teague. The quartet helped the Wolves rally from a 10-point deficit in the fourth quarter, but the Timberwolves only managed two field goals after taking a 92-91 lead with 5:02 remaining on an 18-foot jumper by Butler. Butler finished with 12 points and Crawford had 10. Andrew Wiggins led Minnesota with 26 points and Karl-Anthony Towns had 18. Aldridge had one of his most complete games with the Spurs, two days after signing a three-year, $72 million extension. He shot 9 for 21 from the field and had four assists. He was limited to five attempts in the first quarter as the Spurs did not go out of their way to get the ball to their 6-foot-11 forward, but instead let him ease into the contest. It's part of San Antonio's plans to make Aldridge more comfortable after two frustrating seasons with the Spurs. Aldridge's running dunk on a bounce pass from Manu Ginobili gave the Spurs a 100-92 lead with 1:42 remaining. Ginobili finished nine points and four assists, including a 3-pointer within a minute of entering the game midway through the first quarter. Ginobili received a huge ovation similar to the one he got in the team's final game last season when fans were not sure if he would return. Danny Green added 17 points while shooting 3 for 7 on 3-pointers. Dejounte Murray had 16 points, five rebounds and two assists while starting in place of Parker. 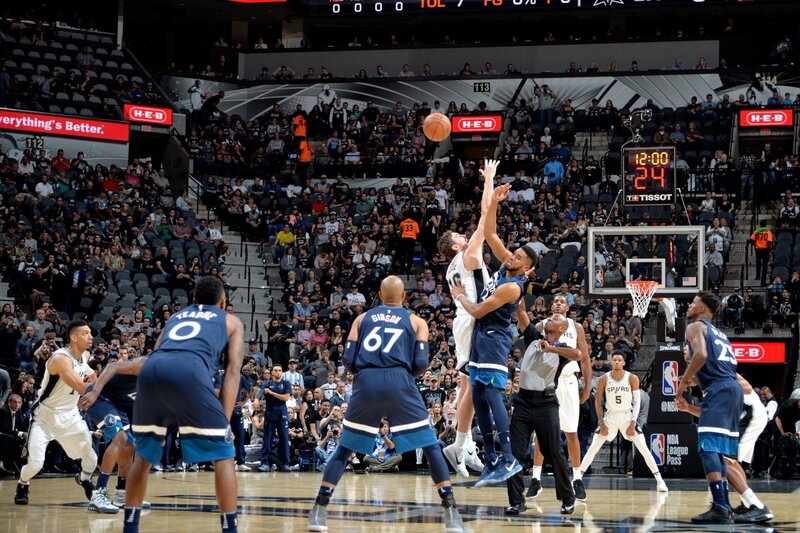 Wolves: Minnesota's last victory over San Antonio came April 8, 2014, in Minneapolis. 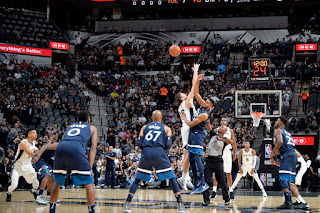 The Timberwolves have lost 12 straight to the Spurs and eight straight in San Antonio. . After being one of the league's youngest teams the past few seasons, Minnesota has only one rookie on its roster this season, 7-foot center Justin Patton. . Patton missed the season opener while recovering from surgery on his left foot. Spurs: San Antonio coach Gregg Popovich said there is no timetable for Leonard's return from right quadriceps tendinopathy. . Parker plans on returning in mid-November from left quadriceps tendon surgery. . San Antonio swept all four games against Minnesota last season, winning by an average of 9.0 points. . San Antonio is coming off back-to-back, 60-win seasons, the first time in franchise history they have achieved that feat. . The Spurs have won 128 regular-season games since Aldridge joined the team, which is the best two-year span in the franchise's history. The second-best mark came the two years prior to Aldridge's arrival, when the team won 122 games. Wolves: Host Utah on Friday. Spurs: Visit Chicago on Saturday.